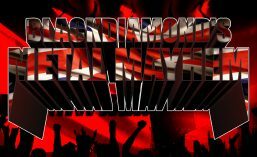 Blackdiamond’s Metal Mayhem has now been going for 7 years, but is celebrating its 6th birthday on http://www.totalrock.com! Tuesday 11th December was a very special edition of the show, starring some awesome guests – Niklas Stålvind, front man of WOLF and Steve Williams and George ‘The Kid’ Karafotis of POWER QUEST! Also a few new singles were on the show from BEAST IN BLACK, NIGHTRAGE and BLACK SHEETS OF RAIN, as well as a few favourites for this birthday celebration! This entry was posted in Radio Shows and tagged 6th Anniversary Show, Blackdiamond's Metal Mayhem, George 'The Kid' Karafotis, Niklas Stålvind, POWER QUEST, Steve Williams, TotalRock, Wolf. Bookmark the permalink.